Every once in a while I have a Very Bad Day. It's not often, but when it happens it's Very Bad. So my husband, Jake, invented a holiday just for me. It doesn't land on the same day each year, and occasionally it will happen twice a year. He calls it Saint Spoiling's Day, and we use it as a wonderful excuse to spoil me by going out to eat, buying me art supplies, or anything else that I want (within reason, of course. We have a budget that we've got to stick to pretty tightly, but sometimes Momma just needs a new pair of sneakers, ya know?). For one day, I don't have to be the maid, cook, nurse, caretaker, therapist, or chauffeur. I just get to be Jaime, and I get to be spoiled. I don't know about you, but Thanksgiving was rough this year for us. My family was so sick with colds that we canceled the big dinner, and passed around tissue boxes instead of turkey. We didn't brave any brick & mortar stores for Black Friday deals, but we've been getting daily deliveries from my online spending spree! Mims has been out of school for over a week (not from the cold, it's the way her school district does holidays) and I'm exhausted from finding creative ways to entertain her while we both felt so crummy. She's also in the middle of a growth spurt, she's shot up an inch over the last month, so even now that her cold is nearly over, she still doesn't feel really good. I need a Saint Spoiling's Day. How about you? Isn't Saint Spoiling's Day wonderful? I know! I love it too! p.s. 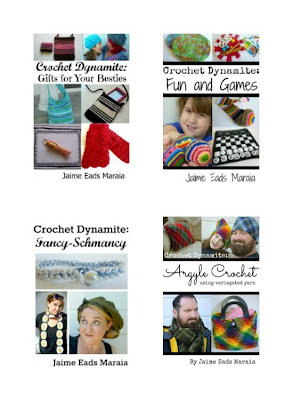 You totally don't have to, but if you wanted to return the favor and "Like" Crochet Dynamite on Facebook and become a Dynamo by following me via email, Google+, Google Friend Connect, Networked Blogs, Twitter or Pinterest, it would totally make my day. Also, well-reviewed books sell better on Amazon, so if you enjoy them, consider leaving a review. If you didn't enjoy them, and have constructive suggestions on how I can make them better, send an email to me at CrochetDynamite@gmail.com! Thank you so much for supporting me and my independent crochet! You are the best, Nyan!!!! Thank you!!!! xo! Jamie, I didn't have the best day either on top of rehabbing my shoulder from surgery in November. This is very generous of you. I also have your books so I shared on G+. I hope you have a better day tomorrow. Hi Stephanie! Thank you so much!!! I hope your shoulder heals really quickly!! xo!! Jaime, I discovered your blog after purchasing your 'gifts for your besties' book on Amazon.com (I have since gotten the rest of your books there!). I decided as a Christmas gift for my 3 girls, I will make them either the London Crochet bag, Tardis purse or Striped Cross-over bag in whatever color they choose (excepting the Tardis bag of course)! I can't wait to start! Thanks for your great ideas, instructions and interesting blog!